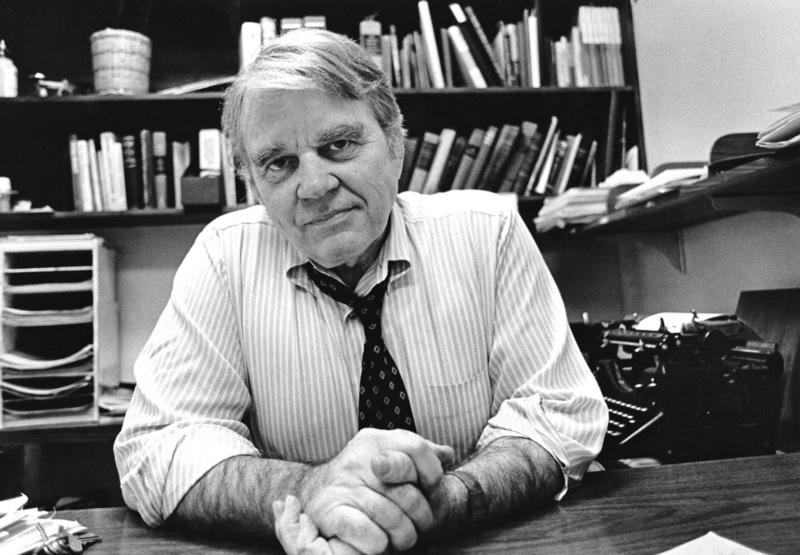 Those of you old enough to remember Andy Rooney on “60 Minutes” will recall that the opening line of many of his segments was the title of this post. So, “didja ever notice” how every guitar seems to be all original except for something somebody did to it along the way? All original except for the Grovers. All original except for the frets, the nut and the saddles. All original except for the plastic, the pickups and , oh yeah, the finish. You’ve done it, I’ve done it. It’s just marketing. But beyond the typical stuff people do, there are some other things they do beyond the usual disasters. Not all mods are terrible but they all will take something away from the vintage value. I can think of a couple that are kind of break even like taking the stereo circuit out of a 345 (as long as you keep it with the guitar). Adding a stop tail to a trapeze equipped 60’s ES-335 won’t hurt the value much (as long as you put it in the right place) since everybody seems to want to do that anyway. But there are some pretty alarming things have have perpetrated on these (and other) guitars over the years. And even rock stars aren’t immune to the overwhelming desire to somehow make what is nearly a perfect guitar somehow better. Alvin Lee put a single coil between the hum buckers on his 335. Larry Carlton stop tailed his 68 and missed by about a half inch. At least all EC did was to add a set of Grovers, a Hare Krishna sticker and a “custom” truss cover. Somehow that added around $800,000 to the value (oh, yeah and he played it). Neil Young swapped out some pickups in that old black Les Paul and Frank Zappa never met a guitar he couldn’t “improve.” But beyond rock stars, we mere mortals have done some monumentally stupid things (and some that were simply ill advised). One of the most frustrating things about a 3×5 is the harness. It’s really hard to remove ad even harder to install especially if the center block isn’t cut. Then it has to go in and out through the f-holes. Well, that’s an easy fix. Just cut a big hole in the back and put a plastic plate over it. But wait, that will show. I know, cut a big wedge out of the top-it’ll be covered by the pick guard. Nobody will ever know (except that they will). Bad intonation? How about a 70’s “harmonica” bridge-that won’t look too bad. A lot of mods were supposed to be improvements (I’m sure Alvin Lee really liked the extra pickup) and they were simply the fads of the era. Coil taps were a big deal in the early to mid 70’s and a lot of mini switches sprouted on the tops of 335’s. Master volumes were also added during that dark decade. The 80’s brought DiMarzio pickups and, eventually, active electronics. Fortunately, plenty of players left their guitars alone and those are the ones getting the premium prices these days. Also, many of the mods over the years have been reversible. 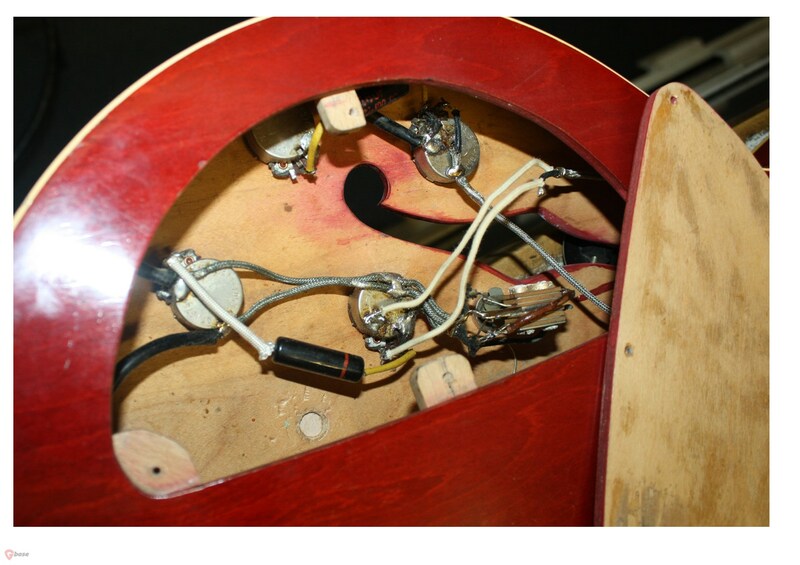 You can take the DiMarzios or the EMGs out but you can’t grow the wood back where that coil tap and phase switches went. Yep, we’re idiots all right but we can take some comfort in the fact that we were young when we did all this dumb stuff and we know better now. After all, they were just old guitars back then. Vintage was for wine (which we didn’t drink-we were men-we drank Jack Daniels). 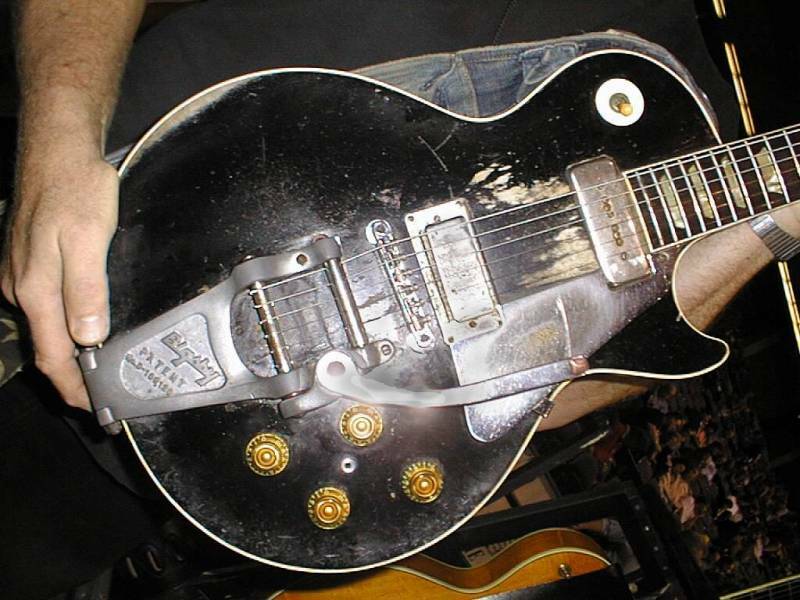 So, when you send that Les Paul R9 out to Historic Makeovers for the full treatment, just remember that in 2060, somebody is going to moan that some idiot messed up a perfectly good 2000 Les Paul by refinishing it, changing the fingerboard and taking the all important “condom” off the truss rod. Everybody knows the tone for those comes from that truss rod condom. This probably seemed like a good idea at the time. 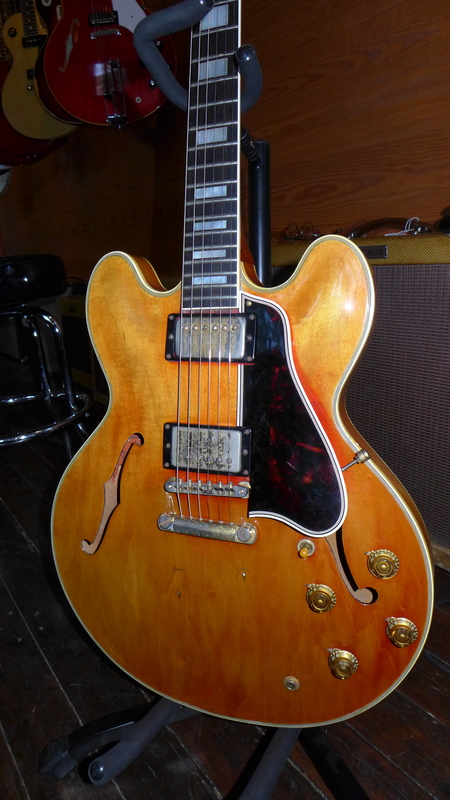 This is a 64 ES-335. It’s all original except for this big ol’ hole in the back. I guess this mod worked out OK for Mr. Young. I’m guessing you wouldn’t touch this guitar with a ten foot pole if I had done this. It’s all original except for a couple of changed pickups. 58 ES-355. Cool. Rare. Evasive. This extreme fade is typical of very early red 355’s. You can see the original color peaking out from behind the guard. Stop tail isn’t factory-this would have had a Bigsby. If you’ve been reading my posts for a while, you know that I never keep any of the guitars I get. I do tend to jump up and down when I get something really rare like the 63 blonde 335 or any of the three black 59 ES-345’s I’ve had. Or maybe the “nonexistent” red 59 335’s and 345’s or the three stop tail ES-355’s I’ve had. All great guitars and all so impossibly rare that it’s a wonder I ever found them at all. There is one ultra rare ES that I’ve never had-until today that is. In 1958, they made 10 ES-355’s. Now, we know that model years don’t mean very much and the first 59’s were the same as the 58’s but not for long. The 58’s have some very distinctive characteristics that make them interesting and very cool. All of them were mono and every one I’ve seen has gold bonnet knobs. That would change almost immediately in 59 along with a few other features. In 59, the ES-355 would be offered in both stereo and mono and would be fitted with black knobs. The 58 has the 3 ply thin top which lasted into 59 but was gone by the Spring. That’s not what is so interesting, though. 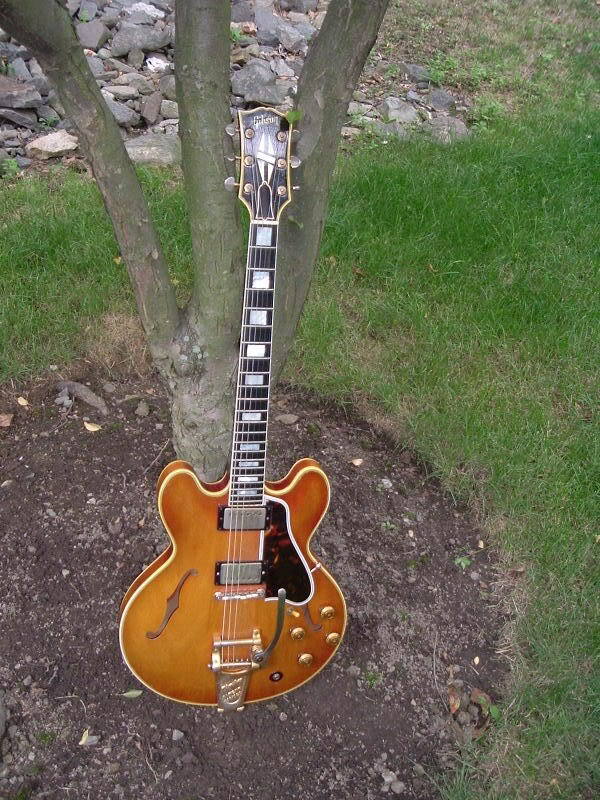 In the late 50’s, there was a burgeoning trend toward smaller neck profiles and, while we are all familiar with the big 58 and 59 335 necks, the ES-355 followed a different timeline. 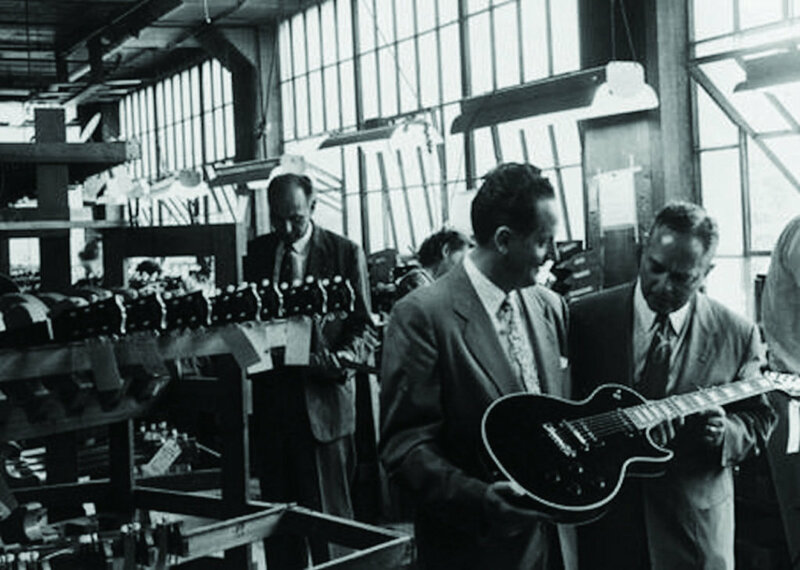 As the top of the line, Gibson saw fit to equip it with a slimmer “faster” neck fairly early in 1959. I can’t tell you exactly when but I can say that big neck ES-355’s are very hard to come by. Out of the perhaps 50 ’59 355’s that I’ve owned or played, only four have had a big fat neck. 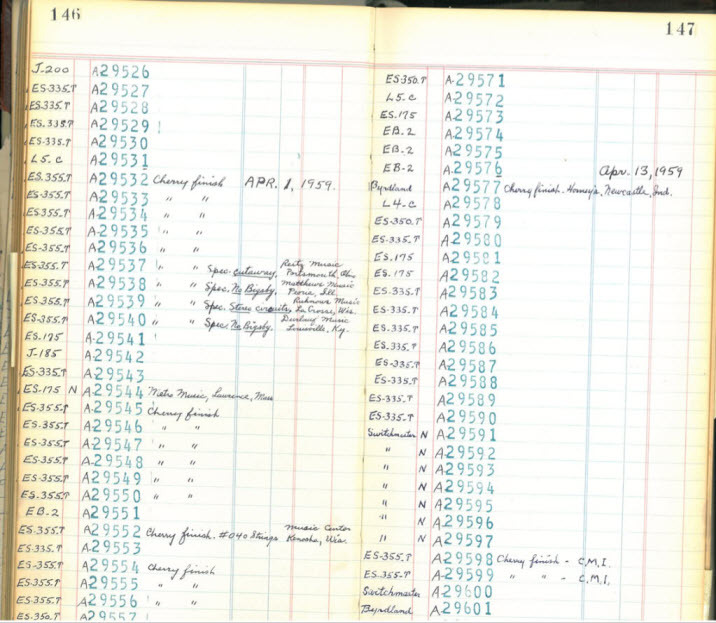 Of those four, all have had a 58 factory order number. There are other interesting features that seem to be limited to 58. They were all red but of the 5 ’58’s I’ve seen, all but one has faded to a pale orange. The 59’s and the early 60’s tend to fade to that wonderful “watermelon” red but the 58’s must have been a slightly different paint/dye formulation. Maybe more like the red element of a burst. Plenty of 59 Les Pauls lose their red element completely. The 58 ES-355 I just got is nearly blonde, it has faded so extensively. It’s not a particularly pretty color but it sure is distinctive. It’s very red under the guard and under the bridge but mostly it’s blonde with an orange tinge. I have seen the first 58 shipped and it also has that orange fade-not as extensively but definitely not watermelon. I was offered another 58 (which I passed on because the seller wanted nearly $25K for it) a few years ago and it too had the orange fade. I know of another that hasn’t faded extensively and I can only assume it spent much of its life in the case. I like this guitar a lot. There’s a list of features that I really like on 3×5’s and very few ES’s have all of them. The neck should be .88″ at the first fret and around 1″ at the 12th. Check. The center block should be uncut. Check. The top should be thin. Check. The guitar should be red. Check (sort of). It should be a stop tail (it’s had one added) and it should be a great player. Check and check. Red ES guitars with a big neck are pretty much limited to late 63 and 64 but even those have more of a medium neck. No 64 is as large as .88″ at the first fret. There are a half dozen red 59 ES-345’s and perhaps five or six red 59 335’s. Add those to the ten 58 355’s and maybe another fifty (could be more-could be less) early 59’s and you have perhaps 75 big neck red ES’s. So, your chances of getting a big fat neck red 335, 345 or 355 is pretty slim. That’s why I jump on them when I see them. And then I sell them. What a dope. 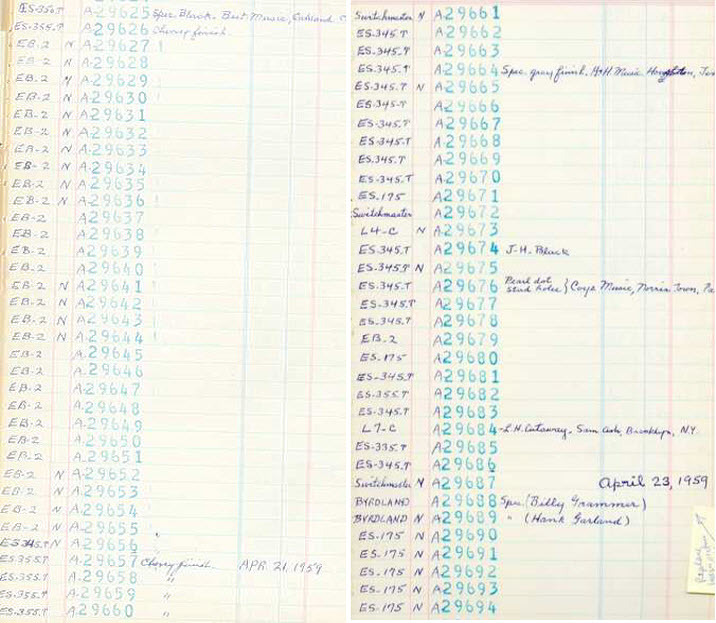 This is the very first 58. Similar fade and, of course, the gold knobs. Thanks to LP Forum member/owner “MacDaddy” for the photo.